Pistons, Rings, Rods & Parts. 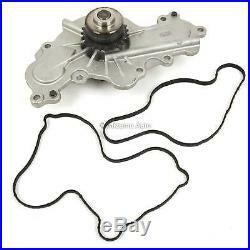 Timing Chain Kit Water Pump Fit 07-10 Ford Edge Taurus Lincoln Mkz 3.5 3.7L V6. 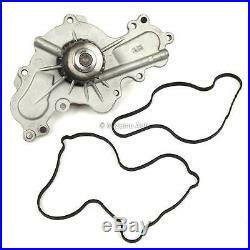 Guaranteed to fit and meet the specifications of the OE parts being replaced. Utilizes the latest in design and material technology, ensuring quiet and maintenance-free experience. Produced under strictly observed quality under highest ISO 9001:2000 international standards. Advanced manufacturing technology ensures durability and optimum operation. Specialized designs yield significant and noticeable improvements to your car engine. Remark: Intake & Exhaust Camshaft Gears are not included. 24/7 Support Ask product experts. 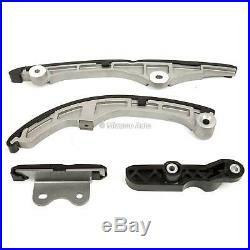 Replace OE Part #: AT4Z-6306-A, 7T4Z-6256-A, 7T4Z-6268-CA, AT4Z-6268-C, 7T4Z-6K254-BA, 7T4Z-6K254-AA, BA5Z-6L266-B, BA5Z-6K255-A, BA5Z-6B274-A, AT4Z-6K297-A, AT4Z-6K297-B. The timing chain is located in the front of the motor and is attached to a set of gears and pulleys that power multiple mechanical components, including the crankshaft and camshaft. In order for your engine to fire, the timing chain must smoothly rotate around the gears without hesitation. Although the timing chain is made out of metal, it is subject to wear and tear and may break if not replaced as recommended by the factory. Since the timing chain can go bad and will need to be replaced, it is important to be able to recognize the symptoms so you can have it repaired before it fails completely. Signs your timing chain needs to be replaced include: Your vehicle has a rough idle, meaning your engine shakes. The vehicle seems to be working harder than normal. Your car will not start at all, indicated a complete timing chain failure. Be sure to use our aftermarket replacement timing chain kit when your timing chain is serviced for the best performance. 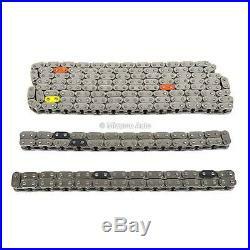 1 Timing Chain (primary lower 202 links). 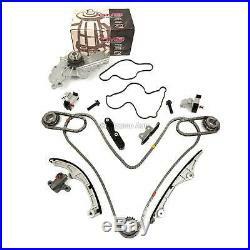 1 Timing Chain upper (cam to cam 2 req). 1 Tensioner primary (lower tensioner). 1 Tensioner right (RH upper chain tensioner). 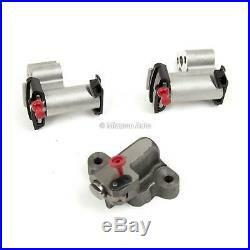 1 Tensioner left (LH upper chain tensioner). 1 Guide Rail righ (fixed short rail). 1 Guide Rail left (fixed short rail). 1 Guide Rail right (tensioner rail). 1 Guide Rail lef (fixed long rail). 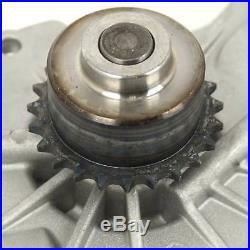 1 Cam Sprocket intake (right actuator) - not included. 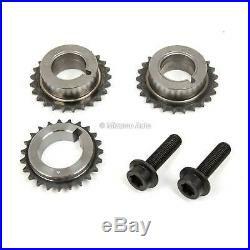 1 Cam Sprocket intake (left, except Taurus) - not included. 2 Cam Sprocket exhaust 25 teeth 2 req. 1 Crank Sprocket (23 teeth). 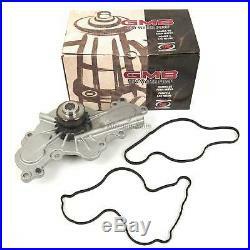 1 GMB Water Pump w/ Gasket. Return item must be well packed in original manufacturers packing and contain everything that was originally provided such as packing materials, hardware, manuals, protective wrap/caps, instruction, etc. There is no-exceptions policy ensures the quality of the components you receive. No exchanges will be made for any product that has been damaged, misused or improper installed. We always recommend professional installation of our products. Mizumo Auto Providing quality OEM production replacement parts to engine rebuilders, specialty warehouses, and distributors for more than a decade. Our product lines represent affordability, quality, and performance to meet the demands of todays challenging market. In addition, Mizumo parts meet or exceed the strict standards of QS9000, ISO9001, and ISO9002. 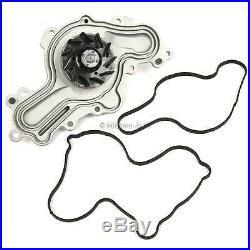 The item "Timing Chain Kit Water Pump Fit 07-10 Ford Edge Taurus Lincoln Mkz 3.5 3.7L V6" is in sale since Tuesday, April 24, 2018. 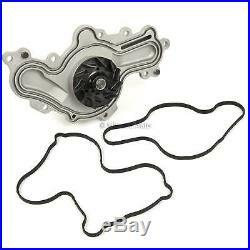 This item is in the category "eBay Motors\Parts & Accessories\Car & Truck Parts\Engines & Components\Timing Components". 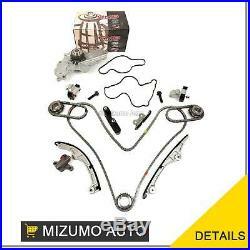 The seller is "mizumoauto" and is located in El Monte, California, United States. This item can be shipped to United States, Canada, United Kingdom, Denmark, Romania, Slovakia, Bulgaria, Czech republic, Finland, Hungary, Latvia, Lithuania, Malta, Estonia, Australia, Greece, Portugal, Cyprus, Slovenia, Japan, Sweden, South Korea, Taiwan, South africa, Thailand, Belgium, France, Hong Kong, Ireland, Netherlands, Poland, Spain, Italy, Germany, Austria, Israel, Mexico, New Zealand, Philippines, Singapore, Switzerland, Norway, Saudi arabia, Ukraine, United arab emirates, Qatar, Kuwait, Bahrain, Croatia, Malaysia, Brazil, Chile, Colombia, Costa rica, Dominican republic, Panama, Trinidad and tobago, Guatemala, El salvador, Honduras, Jamaica, Indonesia.